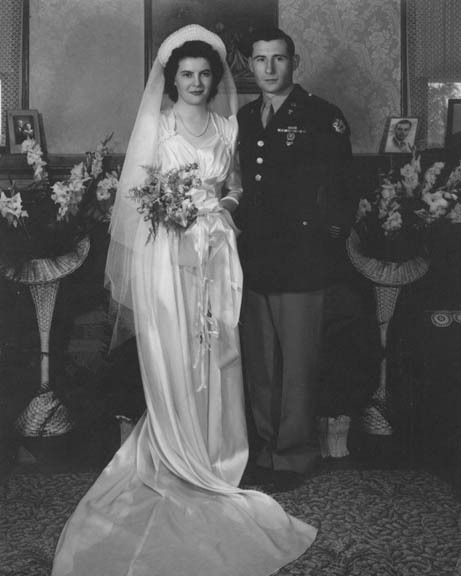 In a double ring ceremony, Miss Rose Marie Miller, daughter of Mr. and Mrs. Lewis B. Miller, Enid, became the bride of Lt. William E. Shaklee, son of Mr. and Mrs. V. S. Shaklee, Watonga. The ceremony was performed at 3:00 p.m. Sunday, February 24, in the First Methodist church in Enid by Rev. Fred Mesch before an altar banked with ferns and baskets of white gladiolas. White satin ribbons caught by bows at the heads of the pews marked the white bridal lane to the altar. Mrs. Julia Thompson, organist, played the accompaniment for Wesley Miller, the bride’s brother, who sang “Because” and “O Perfect Love.” She played “At Dawning” while the candles were being lighted, and “I Love Thee” during the ceremony. The bride was given in marriage by her father. She wore a gown of white bridal satin with a sweetheart neckline and short train and her fingertip veil of net was held by a ruffled net halo. She carried an arm bouquet of white roses centered with a purple throated orchid, and she wore a string of pearls, a gift of the groom. The “six pence” for her shoe was sent from New Guinea when Lieutenant Shaklee was stationed there. Attendants of the bride were her sisters, Miss Bonnie Miller and Mrs. J. D. McDaniel who were attired in jersey and net dresses, one being of pink and the other of blue. they carried bouquets of lavender gladiolas and peach gladiolas and wore matching net Juliet caps. Miss Betty Jean Miller, another sister of the bride, and Miss Mary Ann Shaklee, only sister of the groom, lighted the candles. They wore formal dresses of taffeta in pastel shades. Their flowers were wristlets of sweetpeas. Twins, Robert and Roberta Shaklee, nephew and niece of the groom served as ring-bearer and flower girl and were dressed in white brother-sister suits. Capt. Edmond Peters, Douglas, was best man. Ushers were Wallace, Pierce and Jim Shaklee, brothers of the groom, and Glen Miller, brother of the bride. The bride’s mother chose a blue afternoon gown with matching hat, and Mrs. Shaklee, mother of the groom, chose black crepe with white accent and black accessories. Both mothers wore pink carnation corsages. A reception was given at the home of the bride’s parents following the ceremony. Mrs. Wallace Shaklee cut and served the cake and Mrs. Pierce Shaklee presided at the punch bowl while Mrs. Henry Miller, aunt of the bride kept the guest book. Mrs. C. E. Parker, Mrs. Hugh Cozart and Mrs. Lester Meyer were hostesses in the gift room. Those attending the wedding from Watonga besides the relatives including Mrs. Mabel Ridenour, aunt of the groom, were Mr. and Mrs. Harry Knisley, Mr. and Mrs. Claude Crail and LaDonna, and Mrs. Everett Bradford. The couple left after the reception for Iowa on a wedding trip. For travel the bride wore a two-piece lime green wool suit with black accessories and an orchid corsage. On February 24, 1947, we were living in Pammell Court, Ames, Iowa. Bill went to school that morning at the Iowa State College where he was working on his Master of Science Degree in Genetics. Rose was teaching Freshman English at the College. We had lunch in the Oak Room of the Memorial Union. When Rose came home from her class at 3:00 p.m. she found a box of Pangburn’s chocolates, an album of semi-classical records by Morton Gould and his orchestra, and an anniversary card from her husband. Then she brought out a record album of wedding tunes she had been hiding from Bill. Then she proceeded to cook up a delicious anniversary dinner of fried steak, mashed potatoes and gravy and chocolate pie while Bill played the new records to her. Rose and Bill Shaklee Family at their 20th Anniversary. By our 10th Anniversary, February 24 1956, we had purchased a home in Eastpines; Bill had completed his Doctor of Philosophy degree in Poultry Husbandry at the University of Maryland, College Park; had been promoted to Principal Poultry Geneticist, Cooperative State Research Service, USDA, Washington, DC; and had become active as a Captain in the 450th Civil Affairs Company, a 48 drill unit with pay in the US Army Reserve. Our second and third children, Janelle Marie on September 4, 1951, and Lynda Rose on June 6, 1954, had put in their appearances. We celebrated our 10th wedding anniversary with a Canasta Party at our home. Gene and Gerry Bay, Raul and Priscilla Goehrig, Bob and Mary Lillie, Harold and Helyn Shaklee, and Clif and Miriam Tyson were guests at this gala affair. It was most enjoyable to celebrate this memorable occasion with friends and relatives. By our 20th Anniversary, we had moved to our new home in New Carrollton; we took a “sabbatical leave” at Cornell University, Ithaca, NY; Bill became interested in pistol marksmanship and was promoted to Major in the 354th Civil Affairs Headquarters (B), his principal duty being Food and Agriculture Officer and secondary duty was Marksmanship Coordinator. Our fourth and fifth children arrived; Darlene Kay on March 31, 1959, but was premature and died unfortunately at 3 days of age of hyaline membrane; and Cynthia Jeanne “Cindy” on June 13, 1960. When one of our daughters told her school teacher that Rose could bake cookies for the class because “she didn’t work”, Rose began to enumerate her non-working duties: chauffeur, child raiser, cook, housekeeper, laundress, seamstress, etc. February 24,1966, snow was on the ground several inches thick, Cindy was sick with tonsillitis, and Rose and Bill went out to dinner at the Royal Arms Restaurant in the Hyattsville Federal Center Building. 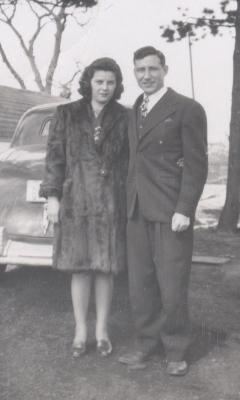 William "Bill" E. Shaklee and Rose Marie Miller were married February 24, 1946, at the First Methodist Church in Enid. Rose grew up on a farm west of Enid and Bill grew up on a farm southwest of Watonga. 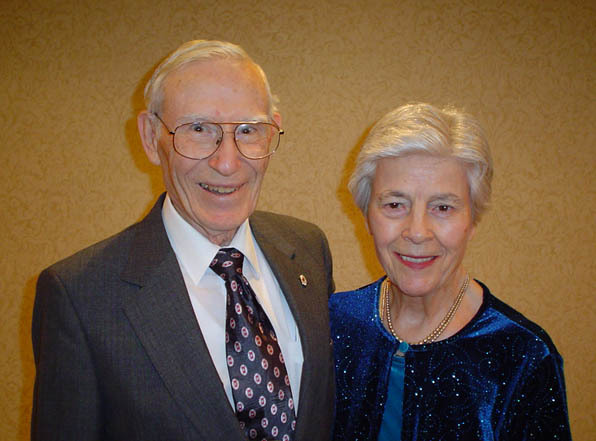 They will celebrate their 60th wedding anniversary at a reception from 2:00 to 4:00 p.m. Saturday February 25 in the Woodworth Room, Epworth Villa, 14901 N. Penn. Ave., Oklahoma City, hosted by their children. Following Bill’s graduation from Oklahoma A. and M. College (now Oklahoma State University) in Stillwater in May 1942, where he earned a bachelor of science degree in Animal Husbandry and a ROTC commission as a 2nd Lieutenant, he was ordered to active duty at the Enid Army Basic Flying School (now Vance Air Force Base) for his initial physical examination. While there he attended the First Methodist Church in Enid and met Rose. After several dates, Bill was transferred to the Quartermaster Replacement Training Center, Fort Francis E. Warren, near Cheyenne, Wyoming, followed by a number of other military assignments. Rose and Bill kept in touch by mail. Almost four years later, Bill returned from overseas duty in the South Pacific and was released from active duty. In the meantime, Rose earned a degree in English and Literature from Phillips University in Enid. Bill attended the Iowa State College in Ames, Iowa, on the G.I. Bill and earned a master of science degree in genetics while Rose taught freshman English. They spent a couple of years at the University of Illinois at Urbana, Illinois, where Bill was a research assistant in animal genetics. Then Bill was appointed principal poultry geneticist at the Agricultural Research Center, Beltsville, Maryland. While there he earned a doctor of philosophy degree at the University of Maryland at College Park. He spent the rest of his civilian career in the Cooperative Research Service, US Department of Agriculture, Washington, DC. After Bill was released from active duty in 1946, he remained in the US Army Reserve. In Maryland he transferred to the Civil Affairs branch and progressed from the 450th Civil Affairs Company to the 300th Civil Affairs Group, the 354th Civil Affairs Headquarters (B) and the 352nd Civil Affairs Headquarters (A) (a general officer command). His principal duties were Food and Agriculture Officer and Marksmanship Coordinator until he was appointed Chief of Staff of the command. He retired as a colonel in 1975, a year before he retired from the US Department of Agriculture. Rose and Bill moved to Enid in July 1976 where they were active in several Enid and Garfield County organizations. In 1992 they moved to the Epworth Villa Retirement Facility in Oklahoma City. Their children are Dr. Ronald V. Shaklee and Dr. Sharon A. Stringer of Youngstown, Ohio; Janelle and Arnold Waggoner, Yukon; Lynda Burns, Norman; and Dr. Cynthia and Jihad Safa, Dearborn, Michigan. One child, Darlene Kay Shaklee, is deceased. They have seven grandchildren and five great-grandchildren. Two grandchildren are deceased. Many months ago our children, Ron, Janelle, Lynda and Cindy, began planning a reception for our 60th Wedding Anniversary. Lynda Burns of Norman, took on the responsibility for local arrangements. She asked the management of Epworth Villa which was the largest meeting room in the facility and then reserved the Woodworth Room for 2 to 4 p.m. Saturday February 25. Our anniversary actually was the 24th, but Saturday was selected because it was the weekend. In consultation with Janelle, Arnold and us, she also reserved the large meeting room at Mimi’s Cafe for a family dinner for 49 following the reception. Janelle Waggoner of Yukon, several weeks before had borrowed the photo album Rose had prepared for our 50th wedding anniversary and scanned many of the pictures from it and used those as well as family pictures that she had in her files. Unknown to us, she had prepared a DVD scrapbook that was shown continuously during the reception. She had asked me to borrow EV’s projector from Tony Gaeddert, Epworth Villa’s computer guru, which I did on Feb. 25, and returned to Tony Feb. 28. Janelle had some difficulty setting up the projector during the reception, but her son Jon’s father-in-law Dave Merrey had experience with such gadgets and soon had it working. Most of our immediate family were involved in decorating the Woodworth Room for the reception under the leadership of granddaughter-in-law Laura Shaklee of Broadview Heights, Ohio. Rose and I were banned from the room until 2:00 p.m. (we were not included in the committee). Janelle had arranged for two huge anniversary cakes, one with our wedding picture on top beside our 60th anniversary picture (it is amazing what bakeries can do now with edible pictures made of icing). Her husband Arnold had brought floral arrangements from his greenhouse for table centerpieces. Cindy Safa of Dearborn, Michigan, prepared the invitations after getting a list of names and addressees from us. She kept track of those who planned to attend the reception and the family dinner. She also included in the invitations to close relatives an opportunity to contribute to a leaf on Epworth Villa’s Tree of Love in our honor. One of Cindy’s daughters, Alia, decided to prepare another scrapbook from our grandchildren. She added pictures of our parents, our children, and grandchildren. Then she asked her cousins to e-mail some memories of their grandparents and received responses from five (Jon Waggoner, Bill Shaklee, Kim Burns, Nabilah Safa, and Alia Safa) of the seven, which she included in the scrapbook. She included pictures of our 25th, 40th, and 50th anniversaries and even one taken just before our 60th. Last but not least was a section for poems. Alia included an original poem by Nabilah and another by Kim. Following dessert at Mimi’s, Ron Shaklee of Youngstown, Ohio, whose hobby is writing, singing, and performing with his guitar original songs, sang a new song he had written especially for this occasion "The Aggie Boy and His Rose Marie". He had published the lyrics and gave us a copy as well as a CD of him singing it. The guest book at the reception was signed by 144 guests, and we received 114 anniversary cards, most with beautiful personal comments. 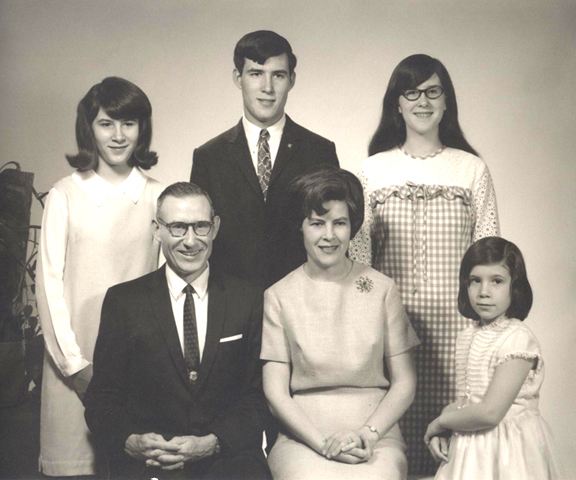 Family members who attended included five of Rose’s siblings and spouses: Ruby* and Jack McDaniel and daughters Patricia Mager, and Becky and Richard Hightower; Lester and Peggy Miller and son David and his partner Rose; Bonnie Miller*; Glen* and Yvonne Miller; and Betty* and Jim Krause. Also my sister-in-law Wilma Shaklee* and Lewis Hurst. Also our children and their spouses: Ron Shaklee and Sharon Stringer; Janelle and Arnold Waggoner; Lynda Burns; and Cindy and Jihad Safa. Also our grandchildren and spouses: Jon and Natalie Waggoner; Bill and Laura Shaklee; Kim Burns; and Nabilah and Alia Safa. Also our great grandchildren: Josh Berry; Micah Waggoner; and Ian, Nathan and Sophia Waggoner. Also Jihad’s mother Inaam Safa and his sister Najla and her husband Tom Long and their daughter Samia. Also Natalie Waggoner’s parents Dave and Barbara Merrey, and my cousin Delphine Jewell. And last but not least were two special guests, Mattie Meyer* and Elaine Smokewood (Oklahoma City University professor who teaches our Write Group), as well as a great many of our Epworth Villa family. *Guests who attended our wedding 60 years ago.